What Remains of Edith Finch is, conceptually, probably the most interesting game I’ve seen in the last year. I’ve still played only about 20 minutes of it. But those are an intriguing 20 minutes. Edith Finch tells a story of the titular Edith, the last survivor of the Finches, investigating her family’s boarded-up home. As you control Edith and try to solve the mystery of what has happened to her apparently cursed family, they find their way into the various sealed bedrooms of family members who’ve died, going back all the way to 1900. 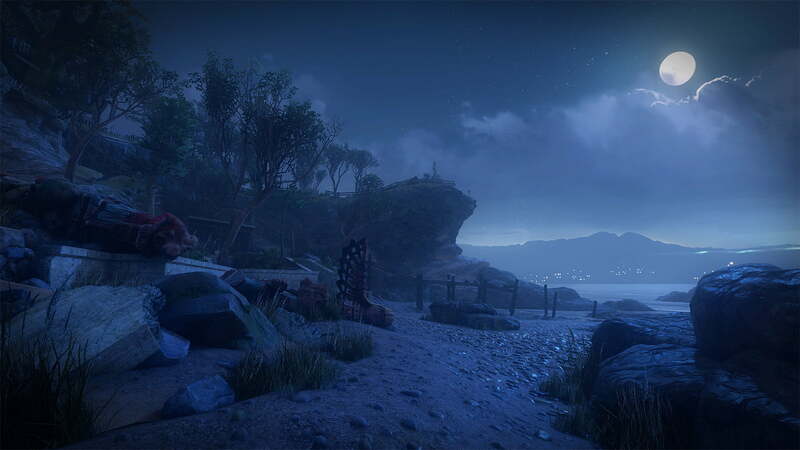 While Edith’s experience of exploring the house is the frame for the game, as Creative Director Ian Dallas puts it, What Remains of Edith Finch is actually a series of smaller games, like interactive short stories. Each first-person vignette has its own set of mechanics, but they all share a particular link — they’re all about Finch family members at the moment of each of their deaths. It sounds dark, but What Remains of Edith Finch isn’t going for horror or shock with these moments. Instead, it’s more of a surreal experience. There’s positivity in dying, as well as tragedy. It’s … weird. 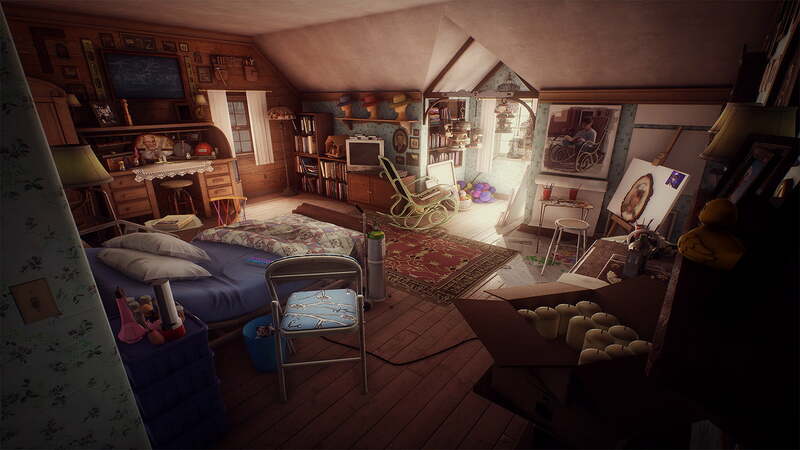 Edith Finch’s frame story plays a lot like the narrative exploration game Gone Home — players explore the home of various other, absent characters, learning about who they were and what they went through based on the remnants of their lives. But that’s only part of the experience. Edith Finch’s playable vignettes work like interactive looks into those character’s psyches, offering a different perspective on who they were and what they went through when they died. Those vignette portions are more like some of the hidden short story experiences in another narrative exploration game, The Vanishing of Ethan Carter, or you could liken it to some of the shifting of characters and mechanics in GameCube horror classic Eternal Darkness. Unlike that game, though, Edith Finch’s vignette bits are a little more thoughtful and weird, and definitely not nearly as frightening or action-driven. The moments in what developer Giant Sparrow has shown of Edith Finch so far are certainly memorable. In one, you control a space-obsessed kid, Calvin Finch, growing up in the 1960s as he swings on a back yard swing set. The idea is to push ever higher, until finally, Calvin achieves the flight he obsesses over — rocketing off his swing, past a fence, and over a cliff toward the waiting ocean. We don’t see Calvin fall; instead, controlling him, we fly out over the waves. From what we’ve seen in his room, we know that he finally achieved what he was longing for, even though it cost him his life. Another scene, the story of Molly Finch, finds the young girl stuck in her 1950s bedroom, punished and sent to bed without dinner. As Molly struggles with her hunger, she imagines herself as a cat stalking a bird in the branches of trees outside her window — and you become the cat. Then the cat becomes an owl, and you soar above a forest, searching for mice to eat. Next, you become a shark, ravaging schools of fish, and finally morph into some strange, tentacle-laden sea creature that lays waste to a ship full of human passengers. The vignette ends with the monster making its way through an undersea pipe to emerge from the plumbing in a bedroom — Molly’s bedroom. Each short story is different, but each illuminates a little bit more of the Finch family, their lives and their deaths. Dallas said that wasn’t always the case, though. 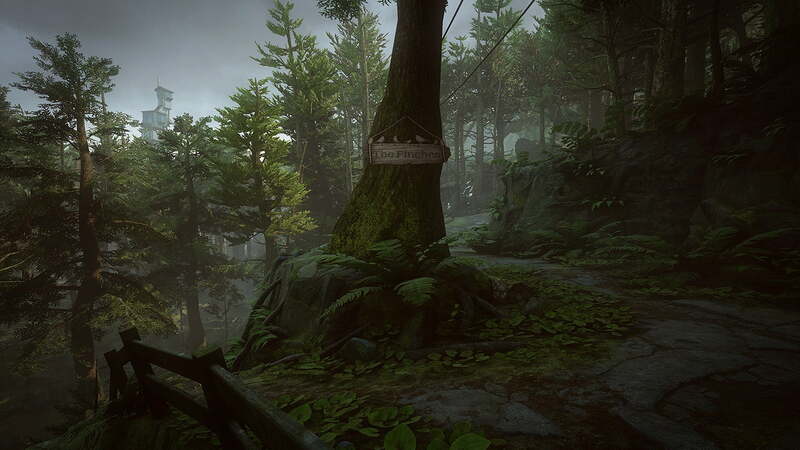 The original idea for Edith Finch was about being freaked out by the natural world. When Giant Sparrow started working on it, the game that became Edith Finch was about scuba diving — although it still looked to invoke the current game’s combination of creeping dread and a surreal sort of beauty. From there, things shifted, Dallas said. There was one conception of Edith Finch in which each short story would be created by a different game developer, creating a kind of anthology, that didn’t work out. Instead, Giant Sparrow landed on the unifying idea of telling the stories of a family, and that started to draw the short story experiences together into a more unified whole. 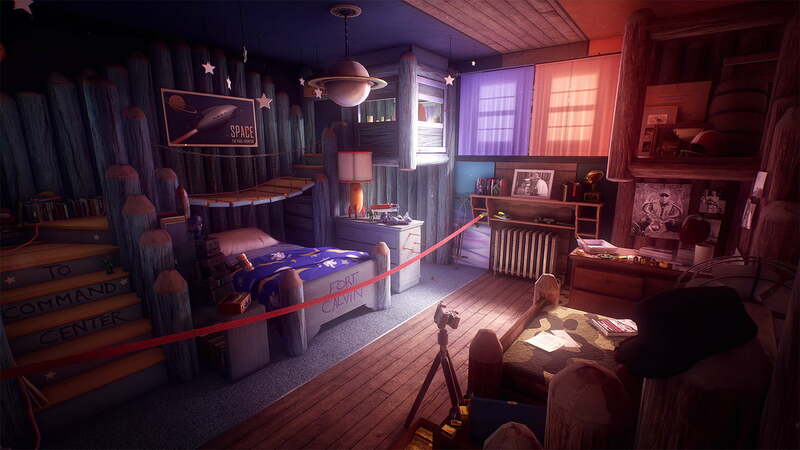 Though it’s a singular game, linked together by Edith’s exploration of the house, Dallas still describes What Remains of Edith Finch as a kind of anthology game, likening it to The Twilight Zone. Each of the short stories pretty much started as a single interactive idea, developed as a Unity prototype, he said. From there, as each idea was refined, Giant Sparrow wrote stories around them. Edith Finch was never a single story built in parts, he said. Instead, it started in the stage of interactivity, with the developers creating interesting moments, and then finding ways to create a whole out of the parts they’d built. That method of constructing the game meant that pieces have come, gone, and changed dramatically, Dallas said. Ideas have sprung from many different places, like concepts for individual characters and the overall story itself as it was coming together, but ultimately it was the ones that were easy and fun to implement through interactivity that were the best. Finding the start of each story, and creating the connective tissue of Edith’s tale, was one thing. Bringing the stories together toward a singular goal was something else. However dark Edith Finch is as it explores death, it’s not all despairing. Molly’s story is strange and fantastical, and Calvin’s is even uplifting, a choice and an affirmation even if it’s a tragic one. We’ll see What Remains of Edith Finch released in early 2017 on PlayStation 4. At that point, Dallas said, he hopes players will play and replay through the various moments of characters’ deaths, and that Giant Sparrow’s game will manage to be affecting without being depressing — to walk a line that brings up a variety of emotions.